An important process with regards to climate change is the prevalence of naturally occurring multi-decadal periods of fluctuations in both global and local temperature, precipitation, and other climate elements. The usual period of these variations is about 50-70 years or roughly 25-35 years between low to high or high to low periods. 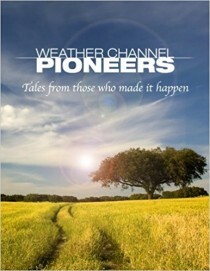 The weather 25-35 years ago can often seem different from what we experience today. I have heard many adults say that the weather-climate now is different than when they were a kid. And this is often true. Such multi-decadal periods have always been part of the earth’s climate system. Such changes have been well documented backward in time for thousands of years in paleo-climate data sets of various types. For example, global cooling periods were experienced between 1880-1910, 1945-1975 and the slight global cooling that has been experienced since 1998. Periods of distinct global surface warming occurred between 1910-1940 and 1975-1998. These changes in climate are hypothesized to be due to the natural back-and-forth swings of the globe’s deep ocean circulation patterns which are primarily driven by upper-ocean salinity differences. These salinity changes are caused by precipitation and evaporation differences on different time and space scales and have no direct association with CO2-induced radiation changes. The Anthropogenic Global Warming (AGW) advocates want us to believe that these natural multi-decadal changes have an important human component that is related to greenhouse gas buildup. This plays well into the hands of those not knowing the causes of such multi-decadal natural climate change. Surface temperature measurements over the last 130 years have also indicated a weaker and longer multi-century period of upward mean global warming trend upon which the shorter and stronger up-and-down multi-decadal warming and cooling periods are superimposed. This longer and weaker multi-century global warming since the 19th century is also hypothesized to result from the multi-century slow-down of the global ocean’s Meridional Overturning Circulation (MOC) of which the Atlantic Ocean Thermohaline Circulation (THC) plays a major part along with the deep water subsidence surrounding the Antarctic continent. Both of these deep water formation areas are brought about by salinity variations (Figure 1). This long-period global surface temperature rise is also hypothesized to result from the globe’s climate slowly recovering from the Little Ice-Age period when the MOC was in a stronger mode. The build-up of CO2 in the atmosphere since the start of the industrial revolution (150 years ago) has resulted in (if all other factors are held constant) a very small gradual build-up in the blockage of long-wave infrared radiation (IR) energy flux to space. Up to now this increasing CO2-induced IR blockage accounts for only about 0.6% (1.4 Wm-2 / 235 Wm-2) of the net balancing in-and-out radiation which our planet continuously receives in solar energy gain and simultaneously gives up as IR radiation energy loss to space. This CO2 influence is too small to be isolated in comparison with all of the other much larger global atmosphere-ocean energy changes involving clouds, rainfall, surface-atmosphere exchange, etc. Whatever the increasing CO2 influence is on our climate, it is very small and resides buried in our global climate’s fluctuating noise levels. It will be many decades before this very weak CO2 warming influence can ever be explicitly determined. Figure 1. (enlarged) Idealized portrayal of the weaker long-term multi-century temperature increase of 0.6-0.7C that the globe has experienced since the later part of the 19th century (blue dashed line). This is hypothesized to be due to the long multi-century ocean Meridional Overturning Circulation (MOC) slow-down from its earlier period stronger state during the Little Ice Age. Superimposed on this recent long period multi-century ocean circulation warming of are shorter periods of stronger multi-decadal warming and cooling shown by the up-and-down red line. These changes are hypothesized to be driven by the shorter period multi-decadal variations in the salinity-induced strength of the Atlantic Ocean THC (green line). 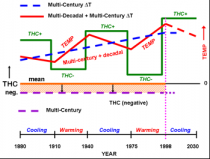 When the Atlantic THC is weak, the globe undergoes weak multi-decadal warming periods of 25-35 years. 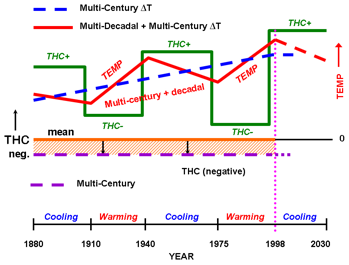 When the THC is strong the globe typically experiences weak multi-decadal cooling periods of this same approximate length. The GCMs which say that CO2’s doubling (near the end of this century) will bring about a global warming of as much as 2-5C are badly flawed. All the GCMs have arbitrary and unrealistically incorporated large additional positive water vapor-enhanced warming into their simulations. These extra vapor warming inclusions are directly tied to CO2 increases. They are not at all realistic. My estimate of global warming for a doubling of CO2 is only about 10-15 percent ( around 0.4C) as much as the amount of warming that the global modelers’ project in their IPCC-AR4 report of about 3C. The severe weather events we have observed over the last two years and this summer’s strong hot and dry conditions over parts of the US are well within the globe’s natural climate variability. Such hot and dry conditions were more extreme in the 1930s. There are many places on the globe right now that are experiencing cooler-than-normal temperatures and above-average precipitation. We should not let the global warming alarmists, who know little about how the globe’s climate really functions, brainwash us into thinking that humans have had a significant influence on the recent unusual weather-climate events the US has been experiencing. Unusual weather-climate events have always occurred and will always continue to occur, irrespective of the amounts of CO2 we put into the atmosphere. 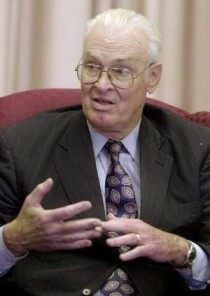 William M. Gray is professor emeritus at the Department of Atmospheric Science at Colorado State University.